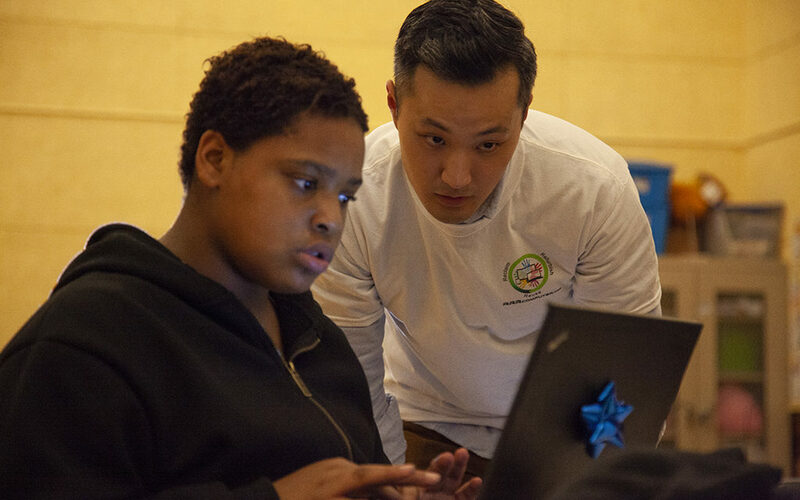 Cesar Chavez Elementary 5th grader Kaeloni Parks (left) setting up her laptop with assistance from volunteer David Liang (right). Photo by Abraham Rodriguez. A very special group of 12 Cesar Chavez Elementary fourth- and fifth-grade students achieved a small milestone this past — and relatively silent — Wednesday night: they received their very first personal computers. “I’m glad so I can have my own privacy, so then nobody can go through my stuff,” said 10-year-old Dayamin Martinez. The gifts were the culmination of a four-week coding class taught by RRR Computers as part of the Jamestown Community Center Beacon after-school program. In addition to teaching the students how to do basic coding, the nonprofit that’s dedicated to closing the digital divide refurbished the laptops for the students. All told, the nonprofit refurbished 60 computers donated by Riverbed Technology. The rest will be used for future classes. Maria Silvas, the Jamestown extended learning manager at Cesar Chavez, said these students now have access to personal tools they wouldn’t otherwise have. Increasingly, she said, schools, and after-school programs like hers, are beginning to integrate digital literacy into their curricula. And a computer, she said, is now a basic tool for success. She said the same program will start up again in January with a few different sessions, although with larger groups of 20. “We’re hoping to be able to give this to all of our kids,” she said. Stop by Casa Bonampak (1051 Valencia St) on Saturday and Sunday around 2 p.m. for hot chocolate, cookies and holiday blessings. Mexican hot cocoa can be had with or without rum. Don’t miss it, because it will be your last holiday season with Casa Bonampak, as the Mexican crafts store is closing in January. For those already entering a more quiet, meditative mood, The Rite Spot (2099 Folsom Street) will host its annual Caroling Sing-Along this Saturday at 9 p.m. Jessica Reddell Popovich will accompany on piano and provide vocal leading on carols and more modern season successes, naughty or nice. Song booklets will be provided; ugly Christmas sweaters are welcome.